Designed for guest students with or without martial arts experience. White Belt to 1st section stripe covering fundamental martial arts skills, including basic stances, blocks, kicks and strikes, plus practical self-defense skills, physical conditioning and Black Belt attitude training. A prerequisite for UMA membership, the Basic Training Program is designed to determine if membership is right for the student. Designed for member students wishing to pursue a Black Belt path. This course is based on the intermediate Qigong forms. In addition we also teach Northern Style Long Fist Form. A comprehensive training program including self-defense application, basic weapon. Designed for committed member students wishing to pursue a Path of Self-Mastery. 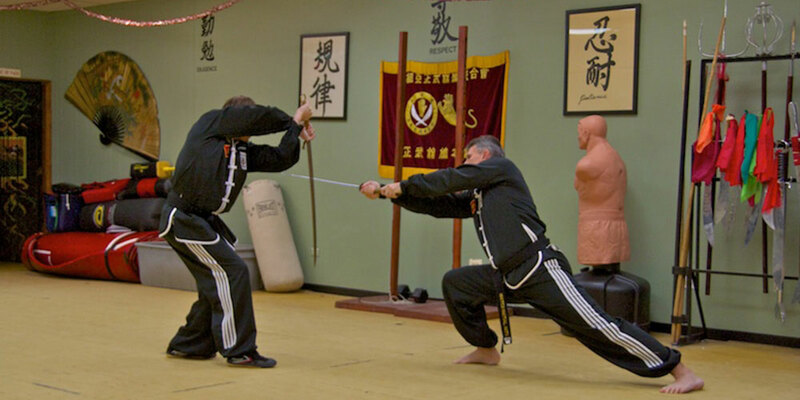 White Belt to 5th Degree Black Belt curriculum including all Black Belt Program training, plus comprehensive instruction in Xing Yi, Northern Chinese Long Fist, Wing Chung, Baguazhang, Tai Chi and other exotic Kung Fu forms. Also features training in 18 traditional weapons, wooden man and body opponent bag application, board breaking and iron hand training, and eligibility (with instructor's approval) for Certified Instructor Training Program (C.I.T.) and accelerated rank advancement. Comprehensive training program for the individual wishing to become a professional martial arts instructor. Covers all aspects of running a martial arts school including teaching techniques, student protocols and business systems.